When I got home, the variation I made was similar, but with a couple added items. It wasn’t better or worse – just different. So follow my basic pizza recipe and instructions, but instead of sauce, top your pie with the ingredients below. Hope you enjoy!!! 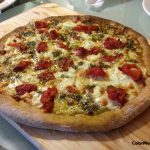 Follow my basic pizza dough recipe from my HOME MADE PIZZA link. Once your dough has been tossed, arrange a single layer of smoked mozzarella. 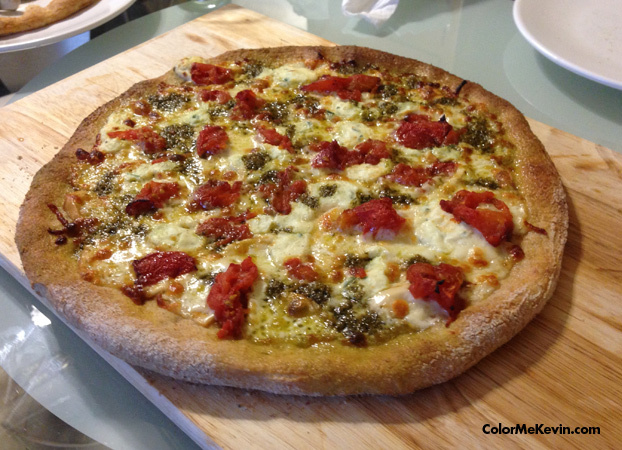 Top with a sprinkling of pesto, & chopped roasted tomatoes. You could end here with just a quick grind of fresh pepper and some sea salt. I had some manicotti filling in the fridge from when my friend made it the other day, so I put some small drops of the filling around the pizza and filled in any bare spots with some italian 4 cheese blend. Through it in the oven for about 4-7 minutes at 500-525F and you will have a delicious dinner that feels like something you’d get during a night out on the town!